When winter hits, it hits hard and you have to figure out ways to own it. Whether that’s dogsledding through a snowy city or skating through a frozen forest, people go to pretty unique extremes to show winter who’s boss. But, from all the videos popping up over social media throughout the winter, this one is a (hang) 10 out of 10. 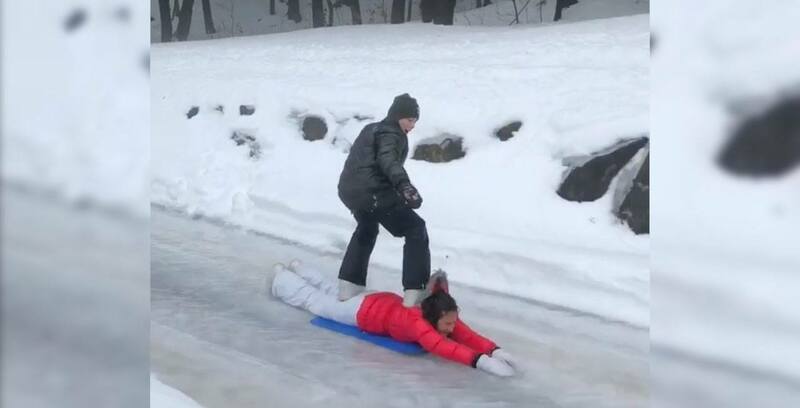 The video was posted to the ‘gram by user Pablo Sxm, whose profile claims he’s a 15-year-old surfer and wakeboarder from the Caribbean, shows two kids overcoming an ice-filled road in Bromont, Quebec, by body surfing down it. And, after checking out his balance, not too many people would argue that he isn’t a surfer. You also have to give kudos to his “board” — a young girl who stays remarkable calm considering she’s wedged in between a magic carpet and a person using her body as a surfboard. Check out the video below, proving that surfers always know how to stay chill, in more ways than one.